Physignathus cocincinus are green with darker stripes of green or brown running down their sides. They have a long tail, which is used as a defense mechanism. This tail makes up almost half to the length of a water dragon. Males are generally larger than females. Males will also have brighter colors and larger crests. These crests will be found on both genders, and continue all the way down the tail. Physignathus cocincinus are great lizards with a lot of personality. They need large cages, and eat a lot but overall, they are good pets to have. Water dragons need height, since they are climbers, but they also need length! Provide branches to climb on, plants, basking areas, hiding areas, and ideally if you can make at least 1/3 of the ground area water. Water Dragons need a space at least 2 x their total length therefore you will need to provide an enclosure that is a min. of 1.8 meters (6 feet) long (side to side), 0,6-0,9 meters (2-3 feet) deep and 1.2-1.8 meters (4-6 feet) high to do it right. Green and Australian can be kept together, with one to three males in a room-sized enclosure. Some females can be domineering and may not want any other females around … others can cohabit with 3-4 females. You must monitor to assure ALL are feeding and basking properly. If any aren’t, you are likely seeing the results of intimidation, and will need to increase the number of basking and feeding areas and/or increase enclosure size, or separate them. If you decide to make a large enclosure for your dragon(s), and you live in a cool climate it would be a good idea to have two or three sides of the enclosure made of wood. Wood is a wonderful insulator, so a vivarium made mostly of wood will hold the heat during cool winter months much better than an enclosure made mostly of glass. If you have a dragon or dragons that are hatchlings or juveniles then you might be able to get away with a smaller aquarium or enclosure for a while but you will eventually need a fairly large area for your dragon so you might as well spend less money by starting out with the right size enclosure. Chinese water dragons rarely use the floor so a hide box is not really needed. They use the plastic hanging leaves, live plants, branches and cork bark (part of the vivarium decoration) to hide. I use eco earth; it’s best for holding moisture and makes the terrarium look more natural. It is easy to clean up and cheap. Day time temperatures should be between 29-31 ºC (84-88 ºF), night time temperatures should be between 24-26 ºC (75-80 ºF). You will definitely need to provide UVB in the form of fluorescent lighting to emulate day/night lighting cycles according to the season. Incandescent bulbs do not produce UVB rays, they usually only provide UVA lighting. The dragon needs UVB to produce vitamin D3 in order to absorb the calcium in the diet, without this lighting the dragon will get very little calcium from the food and supplements that you are giving it and will very likely develop Calcium Deficiency in herbivore and omnivorous reptiles or MBD (metabolic bone disease) which is basically a calcium deficiency, but can also be caused by too much vitamin D3 supplementation as well. 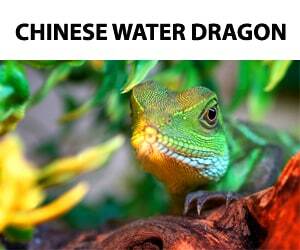 Chinese dragons love water; you should provide a fairly large area of water by either using a large plastic container (I use a cat litter tray) or make a nice water area using an aquarium or something with a water filter and waterfall for example. It can be as simple or as complex as you like. Whatever you use you need a container that is large enough for the dragon to enter and exit easily, and it must be filled with enough water that he can immerse up to 50% of his body height. You should be able to remove the water container easily for cleaning and disinfecting, as well as refreshing the water supply. Humidity should be about 80%, even with a water container in the cage this can be difficult to maintain. I have live plants in my vivarium, planted in soil, so watering and misting these plants also helps to provide a humid atmosphere. You should get a gage that measures the humidity. Try to mist the enclosure twice a day. Dragons at different stages of maturity get fed differently. A hatchling or juvenile needs to be fed daily; an adult- gets fed about every 2 to 3 days, although many people like me do feed their adult dragons on a daily basis. Feed smaller portions if you would like to feed an adult dragon on a daily basis to prevent them from becoming overweight. However, whatever size the dragon is disregard this feeding schedule if the dragon is skinny as you need to get some weight on this little guy! Feed every day in this case, offering food 2 or three times a day. Crickets, mealworms (normal size, jumbo and super), waxworks, and earthworms, grasshoppers, locusts, some people try small feeder fish like goldfish, and you may also want to offer a little bit of finely shredded veggies and fruit (if your dragon will eat veggies this should make up about 10% to 15% of their “diet”). 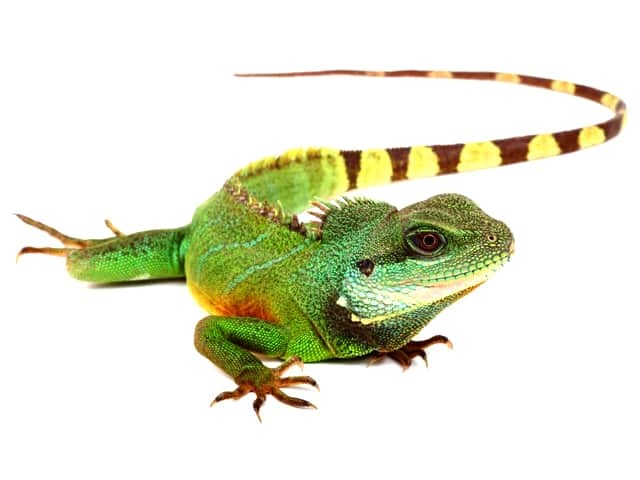 Green Water Dragons, like most lizards, can be very skittish and easy to frighten when young. They will generally try to run away from your hand should you go to pick them up, but some more aggressive specimens may turn around and bite you. Although it is unlikely a Water Dragon will come to enjoy being picked up, most will learn to tolerate it with regular handling. Try hand feeding a few times before you try handling an untamed Green Water Dragon, and do not handle for extended periods of time as this can stress them. Chinese water dragons are quite easy to keep clean as they tend to do the toilet in their water so it is just a case of regular water changes to keep on top of this. If you make daily spot cleaning and water changes it’s up to you when you will replace the substrate. With proper humidity and regular sprayings your dragon should have no problem shedding, you may also give the dragons a soak in the bath if his water bowl is not big enough in order to help him through the process. If your cage is an aquarium, or has glass or plexiglass doors, and is built in such a way that the dragon can see out of the glass at eye level, then you may find that he repeatedly bumps the glass with his snout either trying to get out, or fighting with his reflection… all this bumping will cause very bad damage to his snout in time. A way to prevent this, if your dragon has a tendency to do this, is to plant some plants around the edge of the enclosure or use some paper to create a visual barrier (I got a special mesh to stick on the glass so I can see in but on the inside there is a leafy foliage image so the dragon can’t see out this is working well for me, also my dragon likes to climb on the mesh). This will also help to make your new dragon feel much more secure and give him some hiding places! If your dragon is constantly banging his or her snout on the glass it may be a sign that the dragon’s enclosure is also too small. It may be time to get your dragon a nice large enclosure. The larger the enclosure the less frequently this snout banging activity occurs (but beware of him/her jumping from a height in your vivarium at the glass if he/she can see out as mine did this and damaged her tail hence I got the mesh).